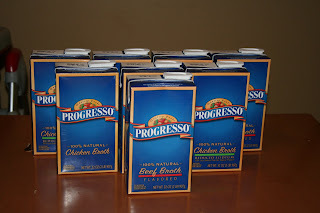 First stop I went to Albertsons and bought 8 Progresso Broths for $1.00. If I had had more of the $1/1 coupons from the paper then it all would have been free, but i had to use some internet printables and some blinkies from Safeway. $1 works for me though! 1 Mini Digital Keychain camera $10 Within my extended family we draw names for the kids and so this looked like a perfect gift for one of my cousin’s kids. OOP = $5 Yay! 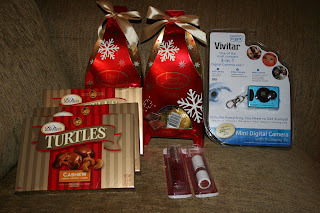 My $10 gift only cost me half the price, thank you Walgreens! FYI, I entered my receipt on which I had bought the Russell Stover chocolates (10.3 oz) and it says I’m eligible for the $10 rebate, even though that size isn’t listed on the rebate. Yeah! I had a great cashier last night at WAG. She manually forced the 2nd DeMet’s chocolate $1.50 off coupon that I had. She figured it should have worked since I was buying 2 boxes of the item. When she told the manager that she had done the override, he agreed with her….yeah! I got a $1 overage on that deal – Sweet! ISpy: I don’t know who you are, but you are funny.